Walsine Pierce: THE GOOD LIFE? Only If You Plan For It! 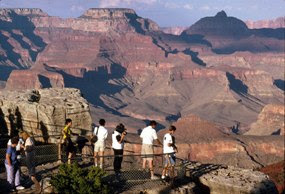 ﻿The Grand Canyon National Park is one of the most visited tourist destinations in the United States. I visited it first in about 1949-50, a quick look over on the way back to my ship on the west coast. Since then, I have visited the park many times, camping for a night or two, the last time in 1981. The canyon remained the same, but the park changed drastically over that thirty year span of time. It will be interesting to see how it has changed in the last thirty years. 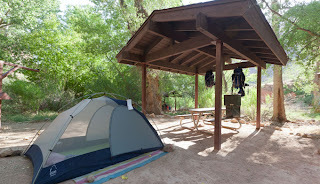 I plan to tent camp in the Mather Campground for the maximum time, seven nights. I have never stayed that long, and never by myself, and I look forward to watching the sun set and rise on a daily basis. Uh, yes, daily naps! After a relaxing week, I'll be on my way to Simi Valley, California to visit with a high school class mate of 1948. My daughter, Kimberly, is making my motel reservations there. Still recovering from total replacement of my left hip, I wanted to camp nearby the water supply, the showers and restroom. I studied the campground and chose camp site 153. It is available for eight days starting May 18th, my arrival day. That site is now mine from May 18-25th. I tried to make the reservation last night, but needed my LIFETIME SENIOR PASS. I tried, and Julie tried, to buy the pass on line, to no avail. Today, I drove to the Visitor's Center of the Cuyahoga Valley National Park to buy the pass, came home and made the reservations. The $18 daily camping fee, $126, was reduced 50% to only $63 with the pass. How can I afford to do this on two relatively small pensions and social security? The answer is quite simple. doesn't know where his last dollar went! My last dollar, actually my last three dollars, went to a little neighborhood youngster who was trying to raise money for his school selling cookie dough. Neither my wife nor I can eat cookies. I explained that to he and his mother, and asked if I could just give him some money. OF COURSE I COULD! I made the decision of where I'd spend how much money. It is just that simple in life. IT IS NEVER TO LATE TO PLAN SOMETHING! What do you have planned that is new, different and exciting? WHY NOT? YOU CAN YOU KNOW!